Click here for the Latest News on Queensland’s first foray into National Championships, how it went and personal comments from the competitors. The 2016 National Sides Championships for Arm Bowlers got under way today at the very popular Gold Coast, Queensland venue of the Broadbeach Bowling Club located in picturesque settings with a handsome backdrop of holiday towers. It was Fours and Pairs today (Monday) with popular Vic. Squad members Ann Power & Lee Wesley representing their State of Victoria in the afternoon pairs against South Australia hammering home a very convincing win. There were some close games in the fours but the Vic.’s prevailed. “The Armed Vic’s have opened their defense of their three in a row National Bowling Arm Championships Winner’s title being conducted over three days at Broadbeach with three wins in the singles and two out of three, wins in the fours. Playing against South Australia in Round One today (Monday) the defending Champions had to survive a couple of very close matches in the singles to record 10 points from their six games. For a breakdown of the matches conducted this morning, the Bowls Victoria website will feature the results from all matches contested. Afternoon rounds in Pairs and Triples are now underway. NSW comfortably eclipsed the Queenslanders who were making their debut in this annual event. The Queensland hosts presented today’s winning sides with special Medallions to mark their achievement. The South Australian players should be pleased with themselves as they enjoyed better results today (Tuesday). They played Queensland and each Side had accumulated 12 points at days’ end. Alas their minus 38 shots took the edge off a little. Morning – Singles – Penny McCarthy lost to David Johnson 10/21; Bill Richards def. Mick Thorne 21/9; Cheryl Barry lost to Roger Goodridge 11/21. Morning – Fours – Arch Baxter, Rodney Haywood, Mal Borlase & Trevor Barry Def. Wendy Usher, Glenn Norton, Geoff Merriman & Gordon Usher 14/13; Phil May, Don Edwards, Stuart Reither & Rodney Egge lost to John McGahan, Cheryl Hutchinson, John Amos & Jim Merrick 8/16; Colin Baker, John Ivanica, John Dann & Ron Colgan def. Bill Roberts, Geoff Cooper, Bob Edwards, Ken Muir 13/9. Afternoon – Pairs – Don Edwards & Trevor Barry lost to Cheryl Hutchinson & Jim Merrick 8/26; Sue Jolly & Bill Richards def. Arthur Collins & Roger Goodridge 14/10; Cheryl Barry & Ron Colgan lost to John McGahan & John Amos 10/20. Afternoon Triples – Penny McCarthy, Rodney Haywood & Mal Borlase def. Brian Newcombe, Lynn Gilbert & Wendy Usher 20/11; Colin Baker, Stuart Reither & Rodney Egge lost to Mick Thorne, Geoff Merriman & Gordon Usher 10/19; Mal Crowther, John Ivanica & John Dann Def. David Johnson, Leigh Hewish & Col Kingham 16/12. Another 3 points 6 points minus 26. Total 12 points minus 38 shots. South Australia will play NSW tomorrow, Wednesday. To see more from Bowls Vic. Click here. Morning Singles – Neil Crisp def. Allan Starrett 21/5, Lee Wesley def. Andrew Capararo 21/19, Ray Arnold lost to Clay Parker 9/21. Afternoon Pairs – P. Godkin & B. Anset (s) drawn with K. Millington & A. Capararo (s) 11/11, A. Power & L. Wesley (s) drawn with I. Percival & A. Starrett (s) 15/15, A. Ryan & & T. Long (s) lost to M. Adams & C. Parker (s) 12/17. Afternoon Triples – R. Bezett, M. Finch & D. Corrigan (s) def. E. Bohannon, D. Davis & N. Creighton (s) 25/10, R. Arnold, P. Gude & N. Crisp (s) def. G. Bookless, W. Allomes & S. Wrzeczycki (s) 25/14, H. Dahllof, D. Smyth & S. Coles (s) lost to G. Lamb, M. O’Neill & K. Davies (s) 15/16. Total for round Vic. 16/211. Total for round NSW. 8/159. It’s all over baby! Vic.’s get 4th in a row with ease! So much talent, so much experience! Bowls Victoria’s State Representative Bowling Arm Team has won its fourth National Championship title in succession. Three wins in the fours and two of the three singles matches against Queensland in the morning session on the final day was enough to secure the outstanding fourth title win for the Armed Vic’s. State Arm Bowling Coordinator and Bowls Victoria Board Director Phil Gude expressed his delight with the side being able to successfully defend the national title for the third time in a row after first winning the title in 2013 at Corowa BC. A title defense in 2014 at Beresfield BC (NSW) followed by victory in South Australia at Tranmere BC in 2015 saw the Armed Vic’s being the hunted for this year’s event in Queensland, with the host state entering the National Championship arena for the first time. It’s been a very busy schedule of matches over the three days of competition with a daily roster of Singles, Pairs, Triples and Fours matches being contested on a state versus state basis for a variety of individual shields and the overall National Bowling Arm Championship Cup donated by Bowls Australia. Victoria and Queensland’s match on Day 3 was for the Trevor Harker Shield, named in honour of the inventor and maker of the first bowling arm device who made it to help out a mate who needed something to allow him to continue to play the sport of Bowls. Everyone playing in this event owes a debt of gratitude to Trevor for his ingenuity in being able to craft a device that has since been technologically advanced in many areas to enable many thousands of bowlers to keep actively participating in the game. NSW won the inaugural shield against Queensland who were outstanding hosts to this highly competitive championship. The South’s retained their shield by putting up a sterling effort in the final session of the challenge. The 2017 Bowls Australia National Bowling Arm Championship will be played on the 11th, 12th and 13th September at Moama. Broadbeach Bowling Club on the Gold Coast, Queensland will play host to the 2016 National Sides Championships for Arm Bowlers on the 5th, 6th and 7th September. Each State plays every other State in Fours, Triples, Pairs and Singles. Allan Starrett, Andrew Capararo, Clay Parker, Ed Wozniak, Edwina Bohannon, Glen Bookless, Gloria Lamb, Ian Percival, John Davis, Ken Davies, Malcolm Adams, Michael O’Neill, Noel Creighton, Richard Hickey, Stan Wrzeczycki. Playing Reserves: Kevin Millington, Warren Allomes. The Committee would like to extend congratulations to all those that were selected for 2016 and also convey to those that were this time unsuccessful, an appreciation for their high quality contributions and performance levels achieved in participating in the Bowlers Arm events and Training Sessions. 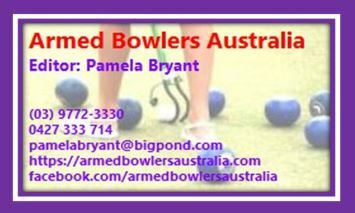 VICTORIA ON THE NATIONALS – Armed Bowlers Selection trials were held on Sunday 3rd April at the Whittlesea Bowling Club. Most of the last (2015) Squad members were there, and quite a few newbies which took the trialing no. to 30 or so. Alas only two newbie women were invited. It was a great surface to play on and it seems all players new and old to the experience of trialing enjoyed their day. VICTORIA ON THE NATIONALS – Selection Trials for the Victorian Armed Squad will take place on Sunday 3rd Apr and Sunday 24th Apr. ’16. The venues will be advised closer to the date, tho’ it is envisaged that Bendigo will be the venue for the 24th. Access to these trials can be gained by winning an Arm event “outright “up until the end of March 2016. So Get Crackin’! Phil Gude (Bowls Vic., in “Heads Up”) also stated, “The selectors are particularly interested in players who perform well in events that showcase two bowls where triples are played and also Regional and State standout performances in open company as they have done in past years”. Graeme Bridge further stated, “From Bowls Victoria’s perspective we wish everyone well in their individual endeavours to make the team and let’s hope the Armed Vic’s can make it four wins in a row in their National Championship”. Q’LD MORE ON THE NATIONAL’S – Approximately 100 Arm Bowlers have expressed an interest in being a part of the 2016 Arm Bowlers Team to represent Queensland at the 2016 National Arm Bowling Championships. To ensure all interested Arm Bowlers are aware of the commitment and cost associated with being in the team, aspiring Arm Bowlers are required to read,complete, sign and return an Expression of Interest. To do this you need to go to the MABA website and then access their team app. To join MABA download this form and send it to David Johnson. There has been a misunderstanding in relation to the dates of the 2016 National Championships. They will be held at Broadbeach Bowls Club from the 5th to the 7th of September 2016. Sunday the 4th of September will be an official practice day. Each State will compete against another State on each day. There are 15 players in each State Team plus 2 or 3 reserves which can be interchanged as required. 3 rinks of fours and 3 singles will compete each morning followed by 3 rinks of triples and 3 rinks of pairs in the afternoon. The selection process for the team to represent Queensland is underway. Results from Arm Bowlers Tournaments at Musgrave Hill, Kawana, Pine Rivers and Helensvale are being collated and combined with individual performances at the Selection Trials held after the Tournaments. Arm Bowlers seeking selection are encouraged to complete the Expression of Interest form, now available on the app or website.